In case you missed my earlier post about FreeBeautyEvents.com, I told you about this new site that I found through another blogger pal of mine, Rinny, from Rinny's Beauty Diary. FreeBeautyEvents.com consolidates exactly what its name says- free, beauty, events by location so you can find out what's happening. They hold monthly contests that giveaway beauty products just by entering and commenting for additional entries. 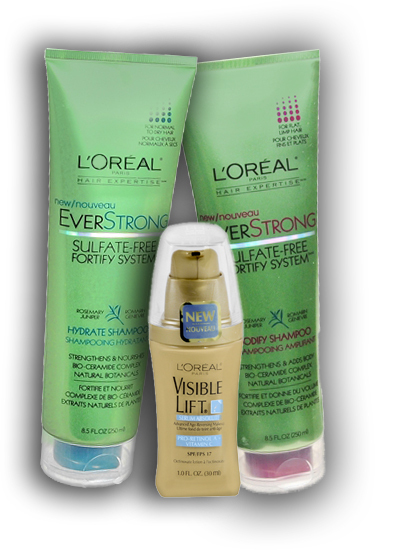 There's still time to enter March's giveaway here to win L'Oreal EverStrong Hydrate shampoo, EverStrong Bodify Shampoo and its Visible Lift Serum Absolute Advanced Age-Reversing Makeup. Hurry- contest ends 3/31/11! They were generous to send me the L'Oreal gift package to test (I actually received the Reconstruct Shampoo instead of Bodify Shampoo). The EverStrong collection by L'Oreal is a sulfate-free line and instead uses natural botanicals and their patented Bio-Ceramide Complex for strengthening your hair. The EverStrong Hydrate Shampoo is meant for Normal to Dry hair, and although I have normal/sometimes oily hair, I find these types of shampoos to be moisturizing without weighing my hair down. I have tried the Hydrate Shampoo before from a sample and found this to be just okay. It made my hair soft but it was a bit too hydrating since my hair felt weighed down a day after. This is great for those with actually dry hair.